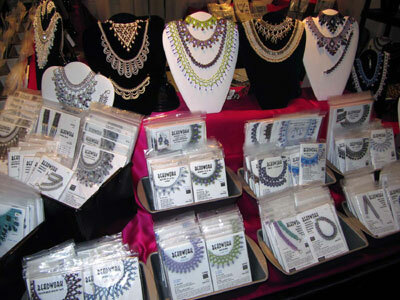 Kits have everything to beadweave your very own accessories. Nothing beats getting into something than by doing! Maria's claim-to-fame is her clearly illustrated step-by-step instructions. The most cost-efficient way to try a new technique is with an all-exclusive Kit. Each one includes instructions, a color photo and colorway choices. There are plenty of beads, all beads stringing materials and findings. All you need is scissors or cutter to clip the beading wire or thread! If you should already have a bead stash, there are Patterns with a supply list included with the color photo of a finished piece. The best references for learning beadweaving are Rypan Designs' Beadwork Lesson Books. Two Assorted Beadwork books are full of unique techniques. They start from the very simple ones, which would look great in today's textured beads, and progress to some very exclusive projects. Assorted Beadweaving: Lesson #2 features the chic diagonal weave, swags, the Gothic series and several earrings. Two Netting Lesson Books start from simple vertical netting to projects progressively adding 'X' motifs, then diamonds and 'V's like in "gerdany", Ukrainian-style beading. The projects vary in widths, increasing/decreasing of collars, trims along the lower edge, including zigzagz and 'V'-shapes in Netted Jagged Mesh: Lessons #2. Look through the Books and Kits & Patterns pages. CLICK icons for enlargement, description, price and kit color choices. See Ordering Info for details and shipping and handling (S+H) costs. telephone: 416-247-1993 ( 9am to 5pm EST); fax: 416-247-2423. Classes just aren't an option for me at this point and it really is gratifying to be able to teach myself something wothout pulling my hair out in frustration."